First off, the Browns used their first-round pick on Baylor wide out Corey Coleman this past draft. Now, he is one of the team’s starting wide receivers along with Josh Gordon (when his suspension is lifted) and Andrew Hawkins. This trio can be deadly with Robert Griffin III. Now, Coleman is the missing key piece in this offense. However, he is joining a team that rarely has success on the offensive side of the ball, but that will change with new Head Coach Hue Jackson in Cleveland and the same with Corey Coleman. In addition, the Baylor product will need to adapt quickly, as he will be targeted by the opposition’s best corner, plus in detail, he needs to get off the line quickly and break free from the corner. On the other hand, Coleman does possess blazing speed with quick ins and outs of his cuts, also he uses his soft hands to reel in catches, which at Baylor he caught 173 passes for 3,009 receiving yards. Next, he will be used as a deep threat and underneath type player, which so far in the pre-season they have displayed with the first team. 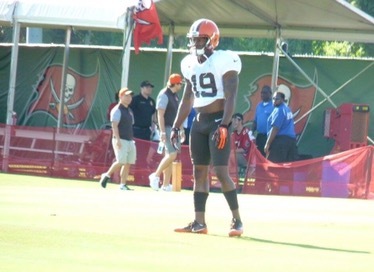 Finally, Coleman had a good training camp, but stood out when the Browns were particapting in a joint practice against the Buccaneers. 2016 Prediction: 50 catches for 887 receiving yards and scoring five times.